“You’ve got to work hard, you’ve got to work hard, if you want anything at all” – one of my favorite lines from the song by Depeche Mode, a popular electronic music band from the 80s. Yes, the notion of ‘working hard” is half banal, half extreme, and half misunderstood (I’m sure you are admiring my math skills here with three halves, aren’t you). People often (mostly?) achieve the best results when faced with adversity, when they need to overcome something, work against difficult circumstances, work hard. Give people everything they want – and they stop growing. Vines are like people. When water and sun are plentiful, the vines can produce a lot of grapes – but those individual grapes can be pretty dull. When the vines need to fight for survival, those much fewer grapes the vines will bear, will have the flavor and finesse almost unachievable in the “nice and easy” setting. When Steve Lutz, the proprietor and winemaker at Lenné Estate in Yamhill-Carlton district in Willamette Valley in Oregon, planted the Pinot Noir vines for the first time back in 2001, 35% of those vines died. Ever heard of Peavine soils? In today’s age of internet, you can easily learn anything you want – so if you want the exact definition of Peavine, you can find it here. But, in the simple terms, Peavine is a mixture of clay and rocks – yeah, not your ideal agricultural setting. So the vines had to work hard to survive, go deep into the soil to find water and nutrients. The payback for all the hard work? A great fruit, the grapes which render themselves to the complex and intriguing wines. Last Wednesday, April 9th, I participated in my second #winechat – a guided virtual tasting which takes place most of the Wednesdays at 6 PM Pacific/9 PM Eastern, in the Twittersphere next to you. The theme of the wine chat was, as I’m sure you guessed already, the wines of Leniné Estate. Steve Lutz was participating in the #winechat, explaining about Peavine soils, talking about his Pinot Noir wine and answering numerous questions (#winechat conversations get generally quite active, with #winechat being among top trending topics on Twitter). In addition to been able to talk to the passionate people with vast knowledge of the subject, what I personally like about the #winechat is that I get to spend dedicated time in my grape geek setting, my grape laboratory. I get to play with the wine and take detailed notes. Coming to the Lenné Pinot Noir tasting, I read in the technical notes that the wine is expected to age well for the next 8-12 years. To me, the immediate thought was – let’s decant! I decanted a small amount of wine about 2 hours before the tasting and put cork stopper into the bottle. 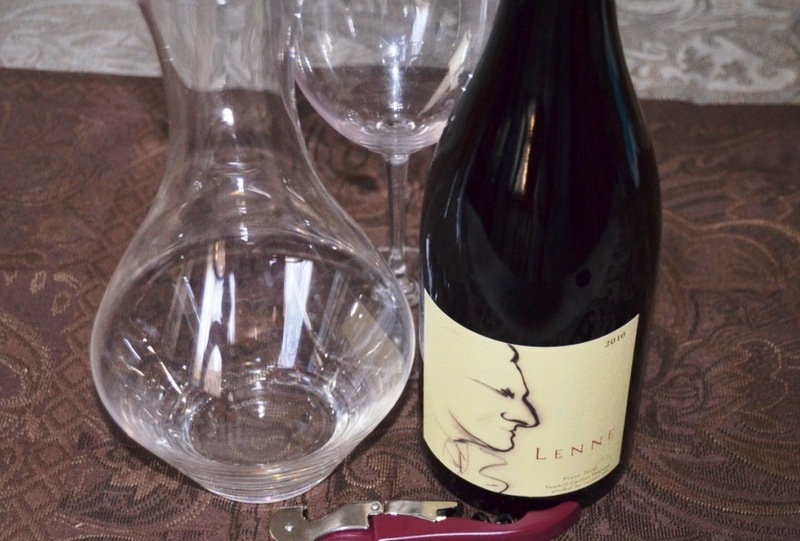 2 hours later, we started the #winechat – 2010 Lenné Estate Pinot Noir Yamhill-Carlton AVA, Oregon (14% ABV, $45). I started with the wine in the bottle, which was at 21°C/70°F. Palate: Beautiful sweet fruit in the back, touch of dark chocolate. Next, I made a big mistake. I decided that I need to chill my Pinot Noir slightly, so I put the wine chiller on. Of course I got carried away with the chat twitter stream, so when I said “oh, crap” and removed the chiller, after about 5 minutes on the bottle, it was already too late. At 12°C/53.6°F, the nose became completely muted, and wine became mostly sweet with some acidity, but the complexity was gone. For the rest of the chat, I kept waiting for the wine to come back to me – chilling is easy, but you can’t play any tricks with warming the wine up, you just have to let air to do its [slow] magic. At 16.2°C/61.1°F , the classic nose came back, together with the palate of cherries and ripe strawberries. Meanwhile, the decanted wine also played in somewhat of a strange way – the wine was showing smooth and elegant – but every sip was leaving me wanting more acidity. The #winechat was over, so I pumped the air out with VacuVin (my standard routine) , and put the bottle aside, to be continued the next day. And the next day – without decanting or any temperature games – the wine was shining! Beautiful nose of cranberries and cherries, with touch of smoke and barnyard – call it funkiness or earthiness, I call it barnyard – just a touch. Beautiful palate with acidity, strawberries and cranberries in the front, then soft, but very present tannins started to gently grip the front of the mouth, and mocha and sweet cherries showed in the back, with pleasant minerality. The finish was lasting almost a minute. Overall this was the perfect example of balance and finesse which may be only Pinot Noir is capable of. That’s all I have for you for today. Now you know – Wine Wednesday is always better with #winechat – join the conversation! Cheers! I had Lenne Pinots for the first time last year – they had a booth at the finish of the Wine Country Half Marathon. Very good wines – very complex and earthy, as you pointed out. Yum! 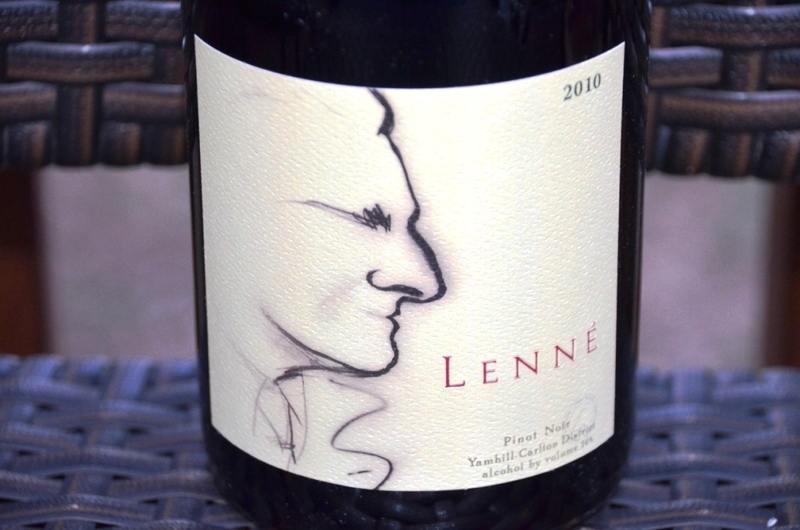 This Lenné estate Pinot was definitely a thought provoking wine. Not only do you have good taste in wine but now that I know you like Depeche Mode’s music it is obvious you are a well rounded person! Cheers.